Sara Brown, Assistant Professor at New Mexico Highlands University. Sara Brown is an Assistant Professor of Forestry at New Mexico Highlands University. She teaches wildfire science and ecology courses, and enjoys working on research problems in the field with her students. She earned her Ph.D. in ecology from the University of Wyoming, her MS in environmental science and regional planning from Washington State University and her BS in environmental science from Willamette University. From 1996-2007, she worked for a variety of federal land management agencies in fire suppression and fire management. She worked on a type-2 fire crew, a helicopter crew, a hotshot crew and as a smokejumper. 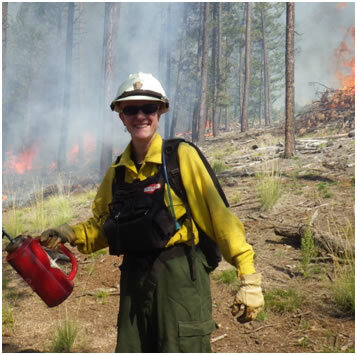 During her time working in fire suppression, she became aware of the importance of integrating scientific research into land management decisions. Her applied research program provides opportunities for both graduate and undergraduate students.